(Sunday, March 12, 2017 – New York, NY) – One hundred and sixty-five guests dined at Restaurant DANIEL—one of New York’s most iconic culinary establishments—for the annual Sunday Supper benefiting Citymeals on Wheels. Citymeals on Wheels is a nonprofit organization that works with community-based organizations and senior centers to prepare and deliver more than 2 million weekend, holiday and emergency meals for over 18,000 homebound elderly New Yorkers every year. The event raised $840,000 to prepare and deliver 113,821 meals for homebound elderly New Yorkers. For twenty years, Citymeals on Wheels Board Co-President Chef Daniel Boulud has hosted this fabulous dinner serving a multi-course menu with celebrated chefs from across America and Europe. Chefs Grant Achatz (Alinea: Chicago, IL), Ludo Lefebvre (Trois Mec: Los Angeles, CA), Edouard Loubet (La Bastide de Capelongue: Bonnieux, France), Heinz Reitbauer (Steirereck: Vienna, Austria), and Raymond Weber (CUT by Wolfgang Puck: New York, NY) cooked alongside Chef Boulud at the sold-out affair. From Restaurant DANIEL, Executive Chef Jean-François Bruel, Chef de Cuisine Eddy Leroux and Executive Pastry Chef Ghaya Oliveira also contributed their talents. The evening’s emcee was culinary expert, food writer and dynamic television personality Gail Simmons, Special Projects Director, Food & Wine and Judge on Bravo’s Top Chef. CK Swett, Co-Founder and Auctioneer of Lot 1 Auctioneers, served as the evening’s auctioneer. Chefs Weber, Bruel and Leroux created the canapés served during cocktail hour as guests whet their appetites for the dinner. For the first course, guests dined on Chef Achatz’s Tigers Milk and Coconut Citrus Vapor Ceviche, while Chef Reitbauer prepared Barbecued Sturgeon with Young Kohlrabi, Quinoa and Elderberry for course number two. Chef Loubet created the entree featuring Daube de Boeuf Provençale Comme une Olive. Castle Valley Red Corn Grits with Provence Black Truffle by Chef Boulud followed the main course and Chef Lefebvre closed out the night with Tahitian Vanilla Rice Pudding with Ricotta Ice Cream, Lemon Brown Butter and Wakame with Chocolats from Chef Oliveira. Wine Director for The Dinex Group, Daniel Johnnes, and Head Sommelier at Restaurant DANIEL Raj Vaidya, selected the fine wines that accompanied each course. The specialty cocktail of the night was “The Patrón Mule,” a play on the original, with Patrón Silver Tequila, Lime and Ginger. The evening’s co-chairs were Nancy and Jon Bauer, Ellen and Robert S. Grimes, and Leslie Ziff. Chef Boulud presented longtime Citymeals supporter John Raphael with the “Serving Good Daily” award. The newly-created honor recognizes those who go above and beyond on behalf of the Citymeals mission. For more than 25 years, Raphael has championed the city’s most vulnerable population, especially through his commitment to the Citymeals Dineout program. 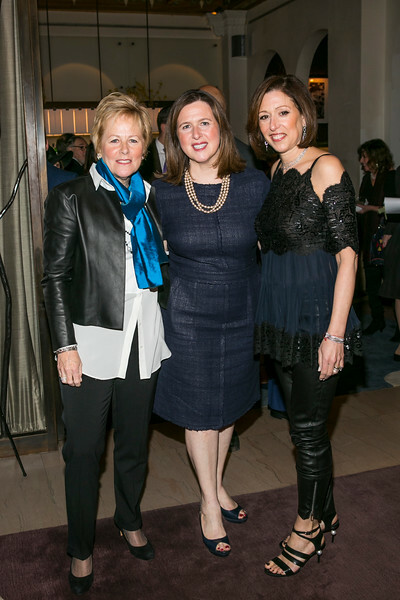 Among the evening’s guests were Beverly Bartfeld, Nancy and Jon Bauer, Dixon Boardman, Katherine Boulud, Joel Buchman, Frank Castronovo, Ariane Daguin, Georgette Farkas, Frank Falcinelli, Rita Jammet, Philippe Laffont, Lela Rose, Citymeals Co-Founder and Board Chair Gael Greene, Citymeals on Wheels Board Co-President Robert S. and his wife Ellen Grimes, and Citymeals Board Members Albert P. Behler, Jim Carter, Joseph M. Cohen, Aaron and his wife Stephanie Goldman, Suri Kasirer and her husband Bruce Teitelbaum, Michael and his wife Ninah Lynne, Drew Nieporent, Lisa Rosenblum, and William T. Speck and his wife Evelyn Lipper. Official sponsors were Citymeals Official Airline American Airlines, Citymeals Official Water FIJI Water, Cadillac, and Spirits Sponsor Tequila Patrón. The evening included live and silent auctions of one-of-a-kind travel and dining experiences, specialty gourmet selections, and rare and large format wines. Live auction lots included an incredible trip to Tourrettes-sur-Loup and Monaco in the South of France, several nights in London at the 5-star Mandarin Oriental-Hyde Park, an idyllic vacation to California Wine Country, and more. Silent auction items included dining experiences at some of New York City’s most distinguished restaurants, including Le Bernardin, Vaucluse and Indian Accent; a luxury tasting experience from Patrón; weekend getaways to Vienna, Los Angeles, Chicago, and other destinations; a Cadillac V-Performance Lab event; and tickets to events such as Hamilton and the New York Yankees Champion Suite with Batting Practice Experience. Citymeals was able to promise that 100% of ticket sales and donations in support of the event will be used entirely for the preparation and delivery of meals. About Citymeals on Wheels: Citymeals on Wheels (citymeals.org) provides a continuous lifeline of nourishing meals and vital companionship to New York City’s homebound elderly. Working in partnership with community-based organizations and senior centers, Citymeals prepares and delivers over 2 million weekend, holiday and emergency meals for more than 18,000 of our frail aged neighbors each year. Last year, over 15,000 individuals volunteered nearly 72,000 hours of their time.